Well, I'm off to West Virginia tomorrow to Washington Romance Writers annual retreat. As I mentioned in a previous post, we are having a Moonlight Madness sale of handmade goods from our talented authors. I posted photos of the first batch of totes I'm selling and today I thought you might want to see the second (and final) batch of totes! I'm offering another style of purse I haven't made in a while. It's from an old McCall's pattern. The purse is a nice size with a flap and magnetic snap closure. 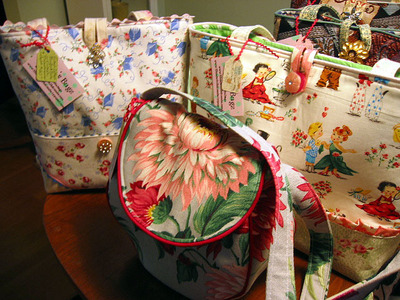 I made all of the purses (all 4) from vintage barkcloth. I used piping to give the purses a more finished look. 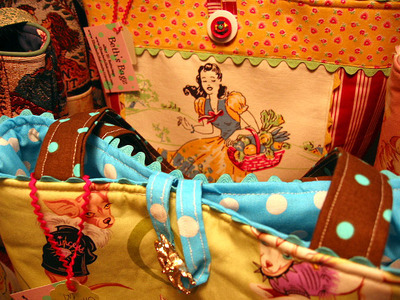 The tote on the left is made from a vintage feedsack fabric with books and roses--perfect for a writer to carry! I especially like the fabric on the tote to the right with the little kids playing dress up. I think it would make a nice diaper bag. THe big pink "mum" on the purse makes such a bold statement. My friend Kathy gave me the romance-themed tapestry style fabric. I added outer pockets and vintage brooches for embellishment! The lady carrying the veggie basket make such a pretty springtime statement! I used a favorite vintage button with fruit on it! 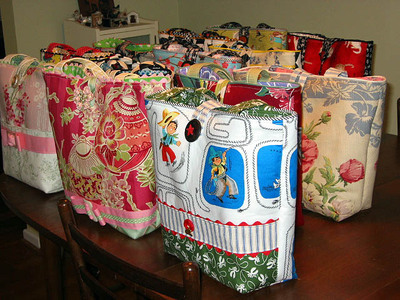 I made totes using as many types of vintage and new fabrics I own: hankies, towels, barkcloth, and feedsacks. I also used new retro and designer cottons with cowboys, horses, dogs, cats, and several other themes. I think theme bags have special appeal. I know I like carrying them! Don's forget to click on Georgia Peachez on my sidebar. MY BFF Suzy is selling my totes and her own at Richmond's Maymont Herb Festival! She posted some wonderful pictures of her offerings (and some of mine!) on her fabulous blog! I am getting ready for next weekend when I head off to the Washington Romance Writers annual retreat in West Virginia. 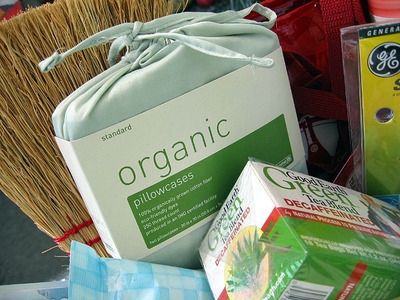 One of the most fun and exciting aspects of the retreat is the generosity of the members in donating baskets of varying themes for a raffle. The one dollar each tickets are sold by the handfuls and money raised goes to charity. It's a substantial amount. 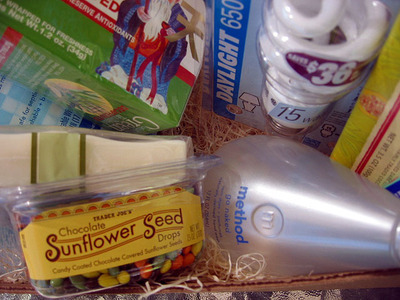 This year I am partnering with my good friend and fellow author Laurin Wittig (www.LaurinWittig.com) on an Earth Day Themed basket entitled "An Inconvenient Basket". So far this is what I have gathered from Target and Trader Joe's. Everything is enviornmentally friendly and some of it is very tasty too! 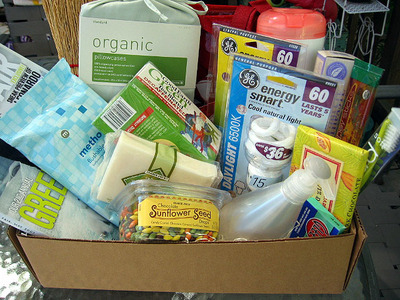 I have packed everything into a recycled cardboard box I got from the garden center yesterday and the packing material is wood excelsior. The GE Energy Smart bulbs are what I hope everyone will consider using. I heard on TV today that if every American home replaced one incandescent bulb with an energy saver bulb it would be like taking 800,000 cars off the road for a year! These soft green pillow cases are made from organically gorwn cotton--I adore the color! I put in the 100% corn whisk broom in for extra texture to the "basket" and everyone needs one of those! 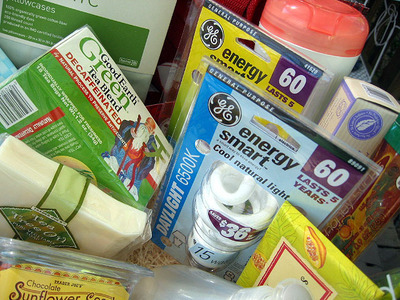 Laurin is donating Al Gore's "An Inconvenient Truth" DVD and some other goodies! My close friends would never call me a "crunchy" kind of girl, but you don't have to be crunchy to understand that we only have one planet to live on. We should take care of it! Happy Earth Day 2007 everyone! Yes, I'll admit it, I take things out of my neighbor's trash. Late last week hubby and I were walking our dog. We passed by a trash pile of garage cast offs put out by one industrious neighbor who has decided to take stuff out of his garage so the car can fit. When I spied this four-step, weathered and worn ladder perched on top of his trash pile, I snatched it off. I later regreted it as the ladder was deceptively heavy and we had a very long and uphill block to go. But I made it and when another neighbor asked me what I was going to do with the ladder, I replied at the time "I don't know yet. Perhaps a plant stand." But where? My deck has enough stuff on it. 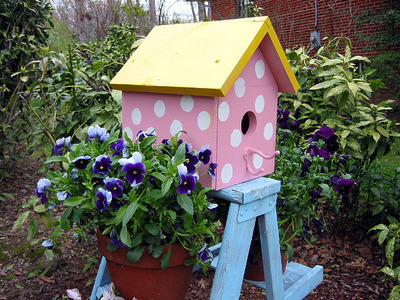 Then I spied the birdhouse my husband had made for me and I had painted pink and yellow. Eureka! I now had a birdhouse stand! This is nothing new or original. I know I've seen this idea somewhere in one of my favorite mags like Country Home Or Country Living or my absolute fave Mary Englebreit Home Companion. My husband was thrilled not to have to sink a post into the dense clay soil in a corner of our front yard too! 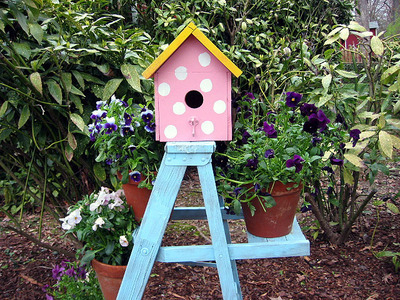 AS you can see I painted the ladder blue which I thought would be a good color with the yellow and pink of the birdhouse. Yellow and blue just GO together! My mother gave me the terra-cotta pots from her enormous stash. I couldn't believe my luck to have four of the same size! I went to my local awesome garden center at noon and found these leggy but still bloom-laden pansies for an unbelieveable two dollars each! The garden expert there told me that our recent winds had burned many of the blooms. I don't mind. 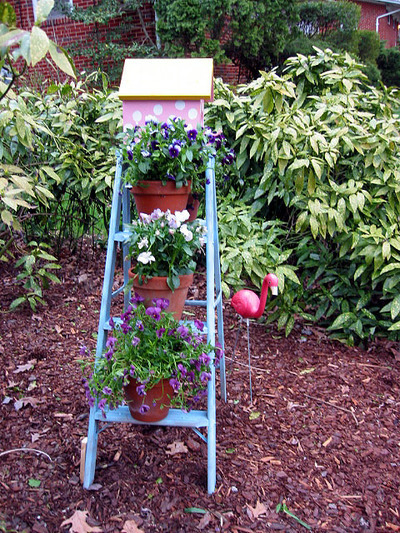 The leggy lush look is perfect for a whimsical cottage garden. I think my plastic flamingo thinks so too. Oh, and in case you might be wondering, the birdhouse is bolted to the ladder and the ladder is bolted to the ground--take a look at the left leg of the ladder to see the stake my hubby screwed the leg to and then hammered into the ground! That ladder isn't going anywhere! I had to turn off the news today. I live in Virginia. I have friends with children at VA Tech, and my husband is a VA Tech alumni Class of 1980. This tragedy is all too much to bear. I had better sew something. I had actually begun my tote odessy on Sunday when it was rainy. In over a week I'll be attending a writer's retreat and for the first time the wonderful retreat planners are offering what they call "Moonlight Madness": a sale of handmade items from the taleted members who like to exercise their creativity beyond words. I am honored to be among them. I don't keep an inventory of the totes I usually offer exclusively on eBay, so I needed to make a lot of bags in a hurry as I didn't know we were having the Moonlight Madness until over a week ago. On Sunday I made nine bags. I felt every inch of it in my neck muscles on Monday and today. I don't recommend a "sew-a-thon" to anyone. But I am pleased with the results of my first batch! 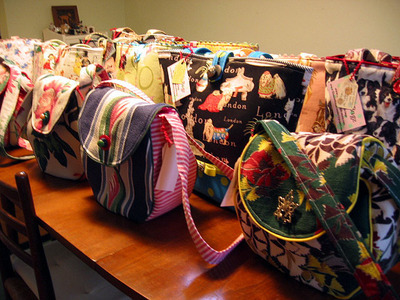 I have created a representative offering of the types of totes I've made for eBay. 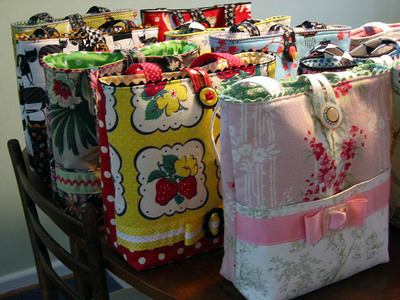 I've sold over 800 totes the past eight years and have no intention of stopping. Those of you gloriously infected with the crafting bug know what I mean. It's a joy to combine fabrics, to see how the colors and prints will go together. I am not afraid of color as you can see! I love to add vintage pins and brooches to my creations. I adore the color palette of old jewelry and the unashamed charm of combining things such as pink plastic and rhinestones! 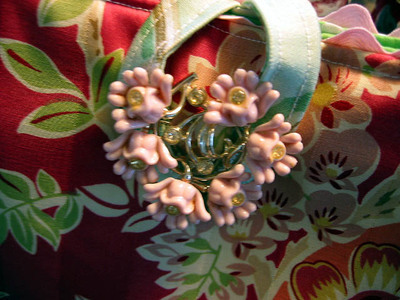 Fabulous old buttons are a favorite embellishment of mine! I couldn't resist this carved bakelite button which picks up the color of the vintage rick rack trim and some of the kitty cat faces on this tote's outer pocket! I stacked the bakelite button on a black button to make it stand out, and I put a black "ball" button on top of that for whimsey! I think this vintage silver brooch, tarnish and all, goes so well with the grey tones of the huge hibiscus flower on this vintage barkcloth! Please continue crafting and dreaming your unique dreams. And pray for the families and friends who have suffered so much loss in past days. Friday is a special day of rememberance. On April 20th please wear MAROON and ORANGE the VA Tech colors to show your support. Hokie Hope: Orange and Maroon Effect Day is April 20th. 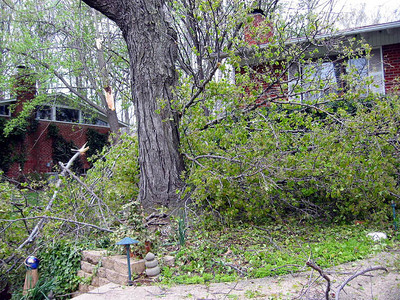 The Washington, DC area was pounded by wind today. I originally was going to post an entry about all of the sewing I've done in the past two days, but I thought I'd postpone that until tomorrow. This afternoon, while I was chatting to my friend Suzy, I hear a loud BOOM. I raced for the living room and peered cautiously out the picture window. 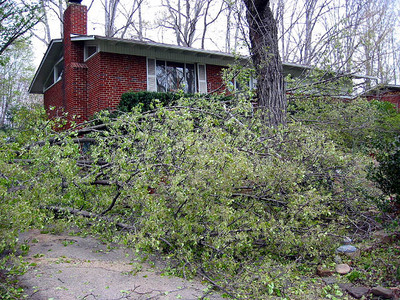 There laying across the end of my driveway and across my front yard, and front steps, was about two-thirds of a Bradford Pear tree. Now, I had decided to move my car before the crash happened. 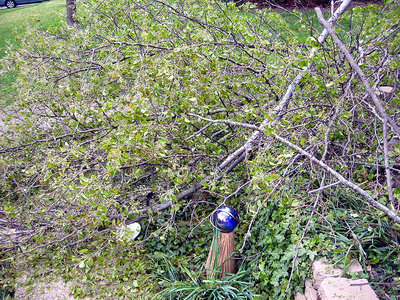 I suspected with the high winds that one of these Bradford Pears which line the boundary between our yard and our neighbors, might come down. I was so lucky! My Volkswagen Beetle would've probably had a crushed hood and broken windshield. 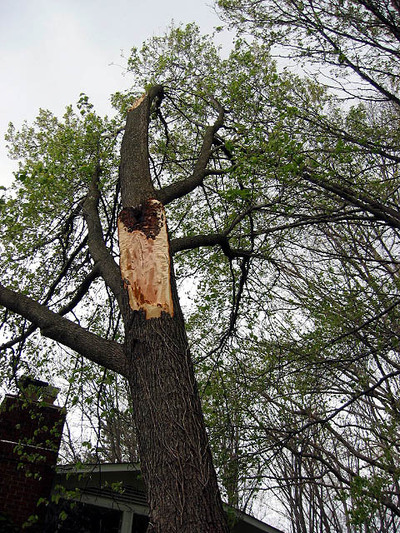 Bradford Pears are, in my opinion, stupid trees. They break all of the time. 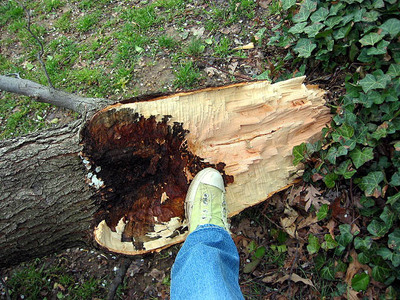 They just don't break a limb, they break in spectacular fashion by either snapping completely in two or splitting down the middle. In Spring the Bradfords look pretty with their little white flowers, but after that they are a menace when ever a big wind comes along. My gazing ball just missed getting smashed! 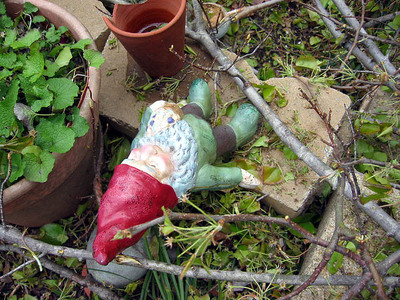 Mr. Gnome was knocked down, but he's made of metal and is a tough little guy! 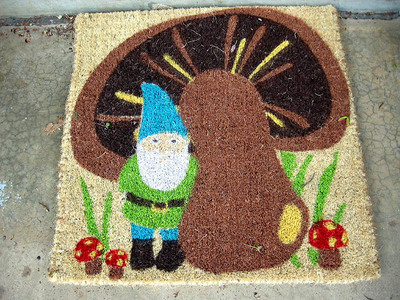 Well, other than a big piece of tree at my front door, I have a new welcome mat! My husband, Dan, came home early! 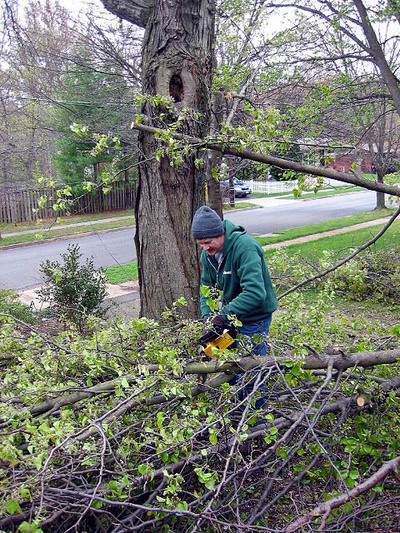 Any excuse to use a chainsaw! I love making these little pin cushions. It's such a highlight of my crafty week! I am always looking to do something a little different with my patterns. I have done the ball on cushion stack before, but not in this large of a size (3 inches on the bottom and 4 inches tall combined). 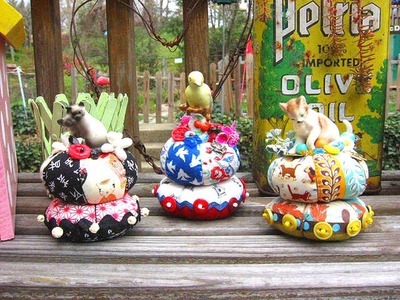 I really like the kitty Kokeshi fabric on the Siames Cat pair pin cushion. I wish I could find more of it! 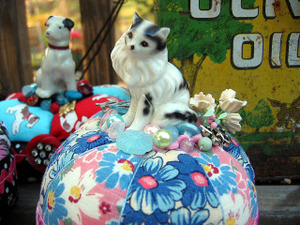 The frisky kitty pin cushion has a fun vintage feedsack fabric on the bottom cushion. I've had it in my stash for a long time and knew the orange and aqua in it would look great with the kitty and his brown spots. I love it when fabrics I've had for a while are ready to come out and play! It was such a chilly day to take pictures but the pin cushions don't seem to mind! I'm listing these cuties on eBay tonight and know they'll find good homes! This is such a chilly spring! The day before Easter we awoke to a crisp layer of snow. 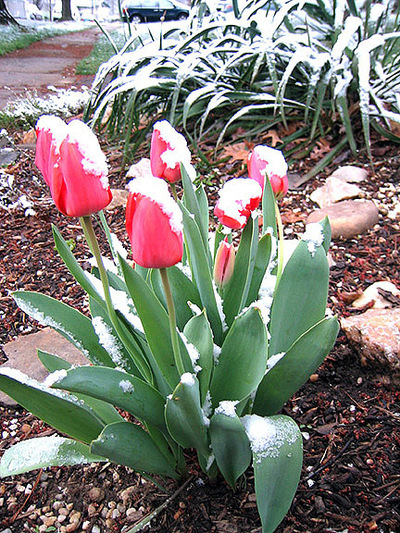 I couldn't resist to photograph the snow on the tulips even though it's melted by now. Today I spent with my wonderful writer's critique group and realized I still need to dig into my new book proposal some more before it's ready to send out. I am anxious to get back to the sewing machine as I have so many projects to do in the next three weeks. 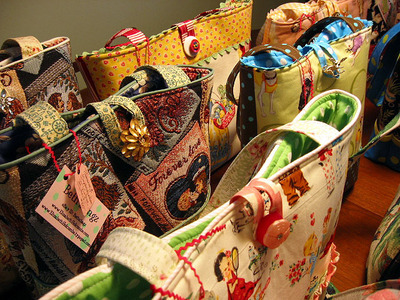 My friend Suzy invited me to sell my bags and pin cushions in her booth at The Maymont Herb Festival in Richmond, Virginia on April 28th. I will be attending my annual writer's conference that weekend so it was very generous of Suzy to include me! 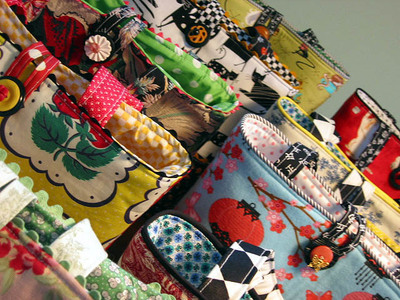 I will also be selling my bags at the conference's "Moonlight Madness" sale that evening! So much sewing so little time! I promise to post photos soon of my myriad amount of creations! I live inside the Washington, DC beltway but I don't live in Washington, DC. Does that make sense? Well, in 2005 professional baseball returned to Washington and my husband has become like that guy in the movie "Fever Pitch", played by Jimmy Fallon. This year my son and I attended Opening Day at RFK Stadium in D.C. with my husband. 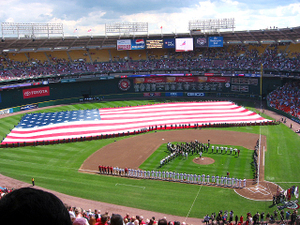 This is the last year baseball will be played at RFK as a new stadium is being built and will open in 2008. Now, living so near to the Nation's Capitol is kind of nice. The cherry blossoms were in full bloom, and we passed them, and the throngs of tourists, on the way to the stadium. I'd be lying if I said I didn't yearn for a stroll under the blossoms of the 93 year-old trees given to the USA by Japan. But we sped onward to RFK. As you may imagine opening day of the national past-time in the nation's capitol is very patriotic. Take a look at the huge flag unfurled by lots of memebers of the armed forces while the Marine band played. If that wasn't enough, fireworks exploded from the field just behind some of the people holding up the flag. I hope they had earplugs! The highlight of the game was not the fact that the visiting Florida Marlins were soundly beating the best intentions of the Washington Nationals to win, but a race by four US president mascots stole the show, the same presidents on Mt. Rushmore in South Dakota. You know them: Lincoln, Washington, Jefferson, and Teddy Roosevelt. 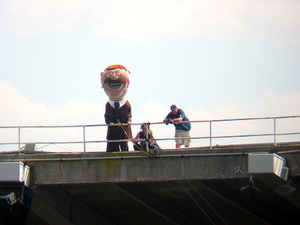 And look who is standing on top of the stadium? Teddy! I nearly died when I saw Teddy climbing over the railing just as the other three presidents came running out onto the field. Then Teddy repelled down to the field like Spiderman. It was the most thrilling part of the game. You can see Teddy above the race "cheating" to win the race. It was fun and something you don't see every day! I was glad to go home and let my husband and his pals attend future games while I stay home and garden and craft. 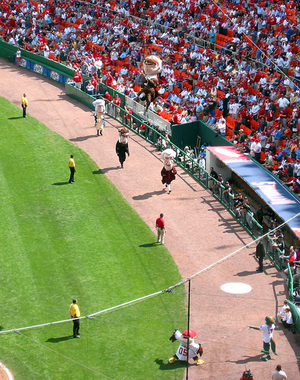 There's not any crafting at RFK Stadium, but it is fun to visit and see a flying Teddy Roosevelt! Before the rain and cooler temps arrived last night in a hail of much-needed rain and sleep-ruining thunder, I took a few pictures of some of my favorite things in my whimsical garden! 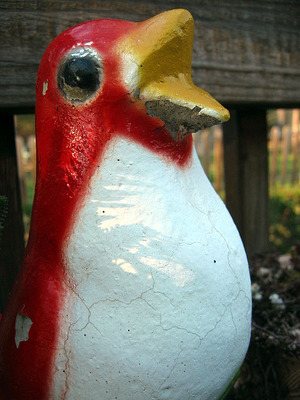 This painted concrete bird is one of my very favorite garden items. He sits on the deck amongst the potted plants. He looks as anxious as I am to get the garden rolling along. I am looking forward to mid-April when it's usually safe for me to put new plants in the garden. 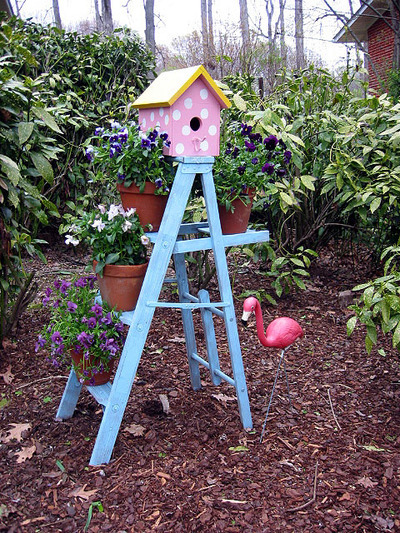 I will be sure to post pictures when my whimsical garden has its spring revival. For now, it's cleaned up and waiting! These concrete flamingos have moved all around my back yard. I have placed them in a shady spot this year where I'll plant a lush bed of Impatiens! Those are the tenderest annuals and I have to make sure the ground is good and warm before they go in! 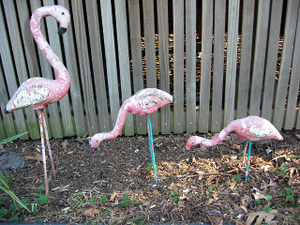 The flamingo trio was given to me years ago by my grandmother's cousin Wilda. She knew I admired them, and when she was moving to assisted living, she let me "adopt" them. She painted them with many layers of pink and white paint, most of which is peeling, but I can't bear to re-paint them as Wilda passed on a few years ago. I like them "shabby" too! 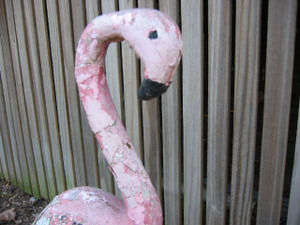 Here's a close up of the big Daddy flamingo! One of my spring chores is to wash my gnomes! I have a large collection of the plastic gnomes, some I bought at a hardware store in Germany, some my friend Barbara brought me from Scotland, and many more. 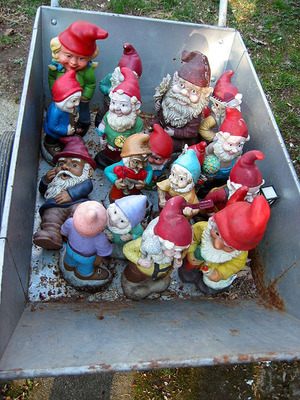 The gnomes live in my garden in a group. This year I'm still trying to decide where to put them. I may let them hide out in the day lily bed! But for now the gnomes will stay in the cart "bathtub" awaiting a good scrubbing to rid them of the winter dirt and grime. 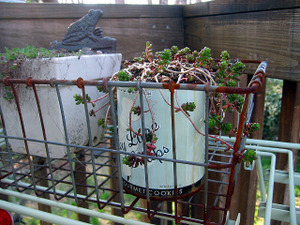 I love sedums and rock garden plants, but instead of placing them in the rock garden I place them in containers of found objects. The green mint tin is a favorite. 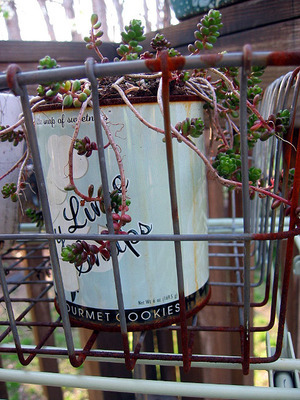 I just punch some holes in the bottom, fill the bottom with broken pot shards, and stick in a sedum! I set it in a trash find of an old wire bike basket which I sat on top of metal fish tank table, another trash find, which I painted a pale, celery green. Last October my husband and I celebrated our 20th anniversary in Delaware's lovely Brandywine Valley, the home of Andrew Wyeth, Longwood Gardens and Wintertur. I bought these fun mushrooms at one of the gift shops. The tops are separate and they sway gently in the breeze. 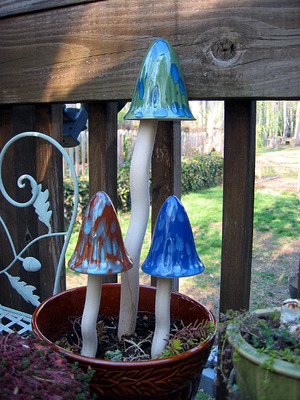 At first that looks a little spooky but they really add a fun touch to my whimsical garden! As the season progresses I'll post more pictures! Thanks for visiting! 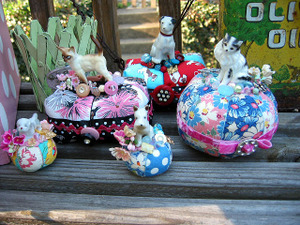 I have made over 300 of these little vintage-inspired pin cushions and never grow weary of making them! As is with my totes, I look forward to combining fabrics on these little creations, but with the pin cushions I use many more baubles, buttons and beads than on my tote creations. Today I finished a fresh batch of pin cushions which are destined for my eBay seller's page Bethsbagz. 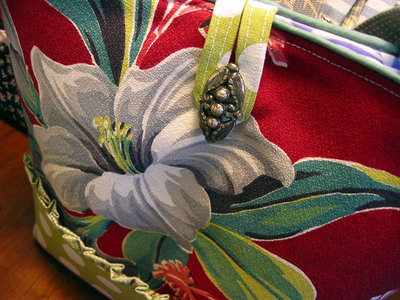 What I love about creating the pin cushions is the intimate nature of making them. I can use tiny buttons that would be lost on one of my totes. The little buttons seem to pop against the porcelain critter! I love small things like charms--I collected a ton of the plastic ones from bubble gum machines when I was a child--and small velvety millinery flowers. My goal is to create little unique treasures that have a more than decorative use such as a pin cushion or lavender sachet. 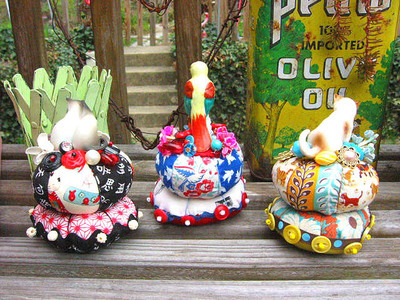 I love using dogs and cats on my pin cushions because I have one of each living in my home, but also because dogs and cats figurines have such a sweet whimsical charm about them. How can we look away from such a sweet face with such wide eyes? The figurines aren't pretentious in any way, having first been sold at a dime store. I like to imagine with each little critter I use the life it must have had before I chose it for one of my creations. Second-hand things have a unique history. My creations are just a part of their history. 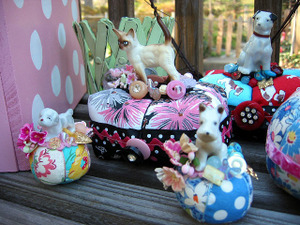 I recently bought some adorable charms from a delightful fellow crafter and blogger. I love it when I find things I need from someone who shares my tastes! Do yourself a favor and check out speckled-egg.blogspot.com Heather is so talented and has a great eye for the coolest ephemera and objects for many uses!